The time has come to call a close to this year’s Dothraki haiku competition. Nice job this year! Too good, in fact. It was really hard to choose a winner. I’d feel more conflicted if winning came with any sort of prize. Thank goodness it doesn’t! Very, very nice! Meghan basically just started working with Dothraki, like, a few weeks ago, and already she’s putting together long strings of text—and using one of my favorite words (qahlan) that rarely sees the light of day. Athdavrazar, zhey Meghan! The best haiku paint a picture, and this one paints a good one. This is close, but there are two issues (one my fault. Sorry!). Here the verb hethkat should be used, in which case it should be hethki not hethke. Next, though I gave everyone the adjective hethke, I never gave the verb, and never said how you’d say “ready to” or “ready for”. That’s my bad there. In fact, you say hethkat ki. So if you wanted to say “they’re ready to hunt and eat”, you’d say hethki k’athfonari ma k’athadakhari. Of course, the last three words would be way over seven syllables, so that wouldn’t work. I really like this idea, though. After all, the Dothraki Sea is a place where horses and lions roam. It stands to reason that the lions would hunt those horses the way lions in our world hunt zebras. That’d be pretty cool to witness. “Be ready in your body”. Very clever! It took me forever to figure out what was intended by the first line, and I eventually needed to seek out ingsve’s help. Turns out he was using an off-brand word for “scout”. I’ve got tihak for “scout” (in the literal sense: someone who serves as a lookout), and I’d probably use that for the “boyscout” version of “scout”. Using oakah for this version of “mind” is interesting (I translated it as “soul”, but the original calls for the English word “mind”). Nice work! Of the dragon that was given (you). In High Valyrian. Ha! I gathered he’d try to work that in, and he did it well. This is a great version of the English phrase “Don’t look a gift horse in the mouth”, and works perfectly. I was also quite pleased to see the correct usage of the negative imperative. And, adding to its worth, I think it sounds better in Dothraki than any translation I can muster in English, which is just awesome. You can hear Zhalio reading it aloud here (brother got some bass in that voice! Nice reading!). The dry land is ready. Worthy of Eliot. An initial draft of this poem had a grammar error, and when he fixed it, it called for a radical reorganization of the syntax of the second line. The result harkens back to the old days of Dothraki, with the verb in initial position. Furthermore, by putting memof, the subject of the sentence, at the end, there’s a curious type of enjambment (if that’s even the right term in this case) which allows one to read memof asavvasoon as a single noun phrase. In fact, memof is the subject, and the phrase asavvasoon modifies the verb phrase. Semantically, though, the great noise (memof) actually is coming from the sky (asavvasoon), so it’s still semantically felicitous. Just awesome. There’s been a decent amount of material written in Dothraki, but this may be the best thing ever composed. 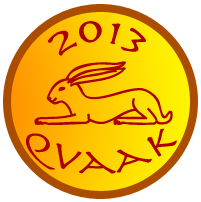 And for that, Qvaak has earned this year’s Mawizzi Virzeth: The Red Rabbit! Thanks so much to everyone who submitted haiku! It was a tough choice this year, and you did incredible work. I’m already looking forward to next year. I also think that (regarding the experiment) I’m going to keep the challenge word as optional only. If it were a requirement, we wouldn’t have seen some incredible haiku (e.g. Zhalio’s), and I wouldn’t want to inhibit that. So I’ll include a challenge word as a possibility to get folks jumpstarted, but it won’t be a requirement. Thanks again for the incredible work! The thing being acted upon (being cause to be something) takes direct object marking. There usually has to be an indirect object to make a complete sentence. When the object is being made to be something, or to possess some quality, that object takes the preposition sy (of, regarding). And when an object is being made to DO something, a relativizer na is used. Nin can be suffixed to intransitive verbs to turn them into transitive verbs, or to some transitive verbs to change the direction of the action. and how she adapts the original myths. retelling the First Branch of the Mabinogion. At the end of my first post on this subject, I stated that I intended to write a follow-up where I would discuss elements that Walton omits from and adds to her retelling. I also want to talk about the social and philosophical ideas which run through all the books but which are particularly prominent in Prince of Annwn. She does have a didactic purpose, setting forth views of the feminine that fit in well with our modern outlook. The First Branch of the Mabinogion falls into three parts. In the first, Pwyll changes bodies with Arawn the King of Annwn in order to take his place and fight an invader of his realm. In the second, Pwyll mounts the mound called Gorsedd Arberth, a place where wonders manifest themselves, and meets his bride Rhiannon, whom he is forced to win through trickery. In the third, Rhiannon gives birth to Pyderi, but when the baby is stolen by some type of monster, Rhiannon is accused of murdering him and is forced to do public penance, after which the child is found and restored to his heritage. Walton cuts out the entire third part. In the "Introduction" to the original text, Gwyn Jones emphasizes that the Mabinogion is really the story of Pryderi, who is the only character to appear in every branch. But Pryderi does not even appear in Walton's Prince of Annwn. I can't recall if the birth of Pryderi is recounted in one of the later novels; I still have to reread those volumes before I can write about them. I think she cuts this part because it doesn't really fit with her tone or some of her themes and would be difficult to integrate with the earlier sections. However, Walton also adds a great deal to the book. The original is a lot like an outline -- it tells you what happens but not why or even how in many cases. She provides more of a cultural setting and she gives the characters motivations. For example, why is it that the god Arawn needs a human to slay his foe Havgan, who came back to life after Arawn killed him in an earlier battle? Pyll asks that very question and Arawn tells him, "Against him I no longer have any power, and no champion of mine can do what I cannot. All the might of Annwn is powerless against him now. But you are called a bull of battle and a woe to your enemies -- the savage, rough strength of earth may do what we cannot." And in one of those bathetic descents, Pwyll remarks, "There is certainly one good thing about earth. When you kill a man there he stays dead. You have no more trouble with him, though his friends and kin may try to make some." But Arawn emphasizes that none may kill Havgan a second time. However, even with this, Walton doesn't make it clear why this is true. It's one of those supernatural things in fantasy and myth that you have to accept. And why is it so important to kill Havgan, who is striving to seize control of the Twilight World of Annwn? In the original his nature is never discussed . Arawn says only that "there is a man whose domain is opposite to mine forever warring against me" and Pwyll never questions him further. In Walton's interpretation Arawn tells Pwyll that every plane of existence has its Grey Man, its Death, and that Havgan is also a Lord of Death. "There are Beings who cast shadows in many worlds. We Grey Men may all be shadows of One beyond your imagining; Havgan may be one of the Shadows of Another." Oddly, his name means "Summer-White," which would make him appear to be benevolent. But Walton presents him as the Sumerian god Nergal, mentioning in her "Sources" note: "We do know that the ancient Sumerians identified their blazing summer sun with Death himself, and worshipped him so at their temple in Cuthah." A brief sortie into Wikipedia produces the following: Nergal "refers to a deity in Babylon with the main seat of his cult at Cuthah. ... Nergal actually seems to be in part a solar deity, ... but only a representative of a certain phase of the sun. Portrayed in hymns and myths as a god of war and pestilence, Nergal seems to represent the sun of noontime and of the summer solstice that brings destruction, high summer being the dead season in the Mesopotamian annual cycle. 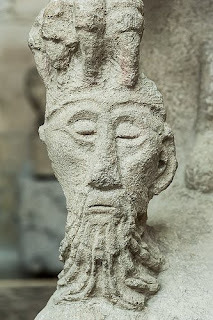 Nergal was also the deity who presides over the netherworld, and who stands at the head of the special pantheon assigned to the government of the dead (supposed to be gathered in a large subterranean cave known as Aralu or Irkalla). In this capacity he has associated with him a goddess Allatu or Ereshkigal." Therefore, Walton makes Havgan a beautiful Eastern Sun-God who has come to invade the Western realms of the Great Goddess. This warlike god will destroy the Twilight Realm of Annwn (the Celtic Underworld, depicted as a peaceful place, one of the many stops for souls as they make their eternal round of existence). However, Havgan will then move on to decimate Earth, the realm of humans, which makes it only fitting that Pwyll, a human, should help out Arawn in his struggle. But for me the intrusion of this warmongering Eastern god also suggests the invasion of Christianity, another Eastern religion that sought to subdue the worship of the Mother and the supremacy of the female principle and substitute a male god as the chief (or sole) object of worship. Christ may have been a proponent of peace, but the religion his followers founded managed to lose that goal somewhere along the way, or to accord it only lip service. Havgan is thus a shadow of another kind of god, a masculine god, perhaps Yahweh. In The White Goddess (Chapter 4), Robert Graves postulates that the Achaeans brought Zeus worship into Greece, diluting the fundamental worship of the female principle among the original inhabitants. And I found an interesting citation in a website entitled "Celtic Women: Myth and Symbol": "What appears to have dismantled this [mother-goddess-oriented] society was the warrior culture and the spread of Christianity into Ireland. ... The appearance of the war-goddess appears to develop as a result of the change in Celtic society to one of violence and paradoxically, Christianity." The original text moves rapidly. Walton slows this pace. Instead of having Arawn conduct Pwyll directly to the court and dwellings of Annwn (in about two sentences), she gives Pwyll three tests along the way, in some of the most memorable sequences in the book. First off, she sends Arawn off on Pwyll's horse and puts Pwyll (in the guise of Arawn) on Arawn's horse. Arawn's horse, which knows its way home and will take Pwyll there, is known simply as the Grey and Pwyll comes to love him. It's a great addition because it gives Pwyll a helpful and trustworthy companion along the way. First they encounter a truly horrific Monster. "Its flat, black head pierced the grey sky, the mighty, hill-like width of the black-scaled chest and shoulders towered above the mists ... It had three sets of jaws, and the fangs of all three dripped blood. From the two lower jaws protruded a human leg. ... Pwyll saw two immense forepaws, he saw a human head dangling from each, its hair caught in the great, glittering claws." Walton says in her "Sources" note that she based this Monster on the Celtic sculpture called the "Monster of Noves" (although all editions of the books that I've seen have it misprinted the "Monster of Moves"), also known as the "Tarasque de Noves" (a tarrasque or tarasque was a dragon-like creature that looks like a cross between a turtle and a stegosaurus). 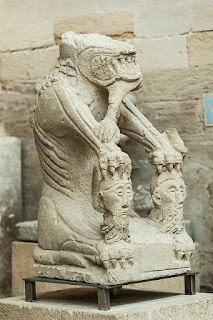 The sculpture itself looks more like some other type of animal; the Encylopedia Britannica calls it a bear, and this image website here refers to it as a lion or perhaps a wolf. Personally, I think it belongs in its own subspecies of monster! 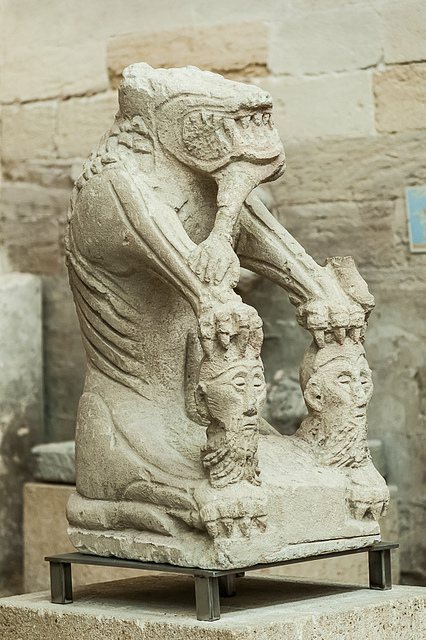 At the top of this post you can see a picture of the Tarasque de Noves, and at the right is a detail from that same photo (you can also view more images here). The Tarasque de Noves seems to relate to the Celtic cult of severed heads. Walton makes effective use of this belief (the heads come to life, as does the leg in the monster's mouth, and they and the Grey help Pwyll defeat it in a fast-paced, highly entertaining battle).
" 'This time the Son will not come back. He has joined the Man-Gods.' Again both skulls laughed together." The reference here is to Mabon son of Madron, which means "Son son of Mother" -- a duo of important Celtic deities. But it's difficult to avoid seeing in this dialogue another reference to Christ. Pwyll is compelled toward the belief that life is a hopeless quagmire and death brings only oblivion. But he passes this test, also, because he is buoyed by an event that happened between his two trials, yet another addition by Walton. He had encountered Rhiannon of the Birds, whom he will see again in the next section, while retaining no recollection of their earlier meeting. I'll talk a little more about that in the next post. Pwyll finally makes it to the Court of Arawn, where he passes one final test. When in the guise of Arawn he goes to bed with Arawn's wife, he is tempted by her beauty, but he is too honorable a man to take advantage of his good fortune and he turns his back to her. When the real Arawn returns later, his wife upbraids him for his coldness and he knows that Pwyll has not betrayed him. For this reason, the Grey Man and the human hero form a lasting bond of friendship. In honor of this friendship, Pwyll is granted the title of Head of Annwn, hence the title of the book Prince of Annwn. I can't end this part without saying a word about the battle with Havgan. First off, the battle takes place at a ford, traditional in Celtic culture. And we get a final look at the Celtic head cult (those arrays of capering heads do help to make this book memorable). When Arawn killed Havgan earlier, the Sun-God begged him to be merciful and to finish him off by cutting off his head, and Arawn, who is a quite benevolent Death God, is impelled to comply. However, the head immediately hops back onto the body and Havgan is as good as new. "Smoke veiled the far side of the ford, smoke and the shadow of that massed blackness that filled the heavens above it. Dimly Pwyll could see the skeletons of trees, still seemingly writhing in the agony that had burned out their lives. This time words of Arawn came back to him: 'Where Havgan treads, nothing grows again. Where he rides, the earth is burnt black beneath his horse's hoofs. He sears the breast of the Mother; all his land is a barren waste.'" However, when Havgan enters the ford, Pwyll sees "a boy young and beautiful as morning," and he begins to doubt the rectitude of his cause. How could anything so beautiful be evil? If he kills Havgan, will the sun ever rise again? Has Arawn been tricking him all along? And Pwyll's physical prowess begins to weaken as his will weakens. But the power of Havgan himself wanes as night approaches. Pwyll finally strikes the ultimate blow and Havgan begs him to put him out of his misery, just as he did with Arawn. "Again Pwyll's arm rose. The blue eyes lit with hope. "They were engulfing him, those sky-hued seas of beauty and longing, those eyes that promised a new universe. And then something -- the cold feel of bonds coiling snakewise round his will -- made Pwyll tear his eyes away ... He looked up ... and he saw the darkness beyond the ford. "If Havgan rose, his men would cross the ford. Would that hot, reeking darkess cross with them?" Mordor! Isn't it Mordor we're seeing beyond the river? Havgan is another Sauron, only one who uses personal beauty to deceive. Prince of Annwn was completed late enough for Evangeline Walton to have read Lord of the Rings, but I don't know if she did. Certainly she hadn't read it when she first began the book. Just the same, the resemblance between Mordor and the descriptions of the army beyond the ford is uncanny. I find that this analysis requires a third post. Next time I'll deal with the second part of the original Branch, where Pwyll meets and courts Rhiannon. And I'll also touch a little bit more on some of the book's themes and on some of its flaws. My previous Miresua word word letter was lerja. That seemed a bit too similar to my word for book, lirju. In addition, the new word doesn't end in A.
I've had a song stuck in my head for a good while now, and like all things that end up in there, it inevitably came out in Sandic form. Here's a video of the song on the tube of yous, and a translation (singable! tested it myself) version is below. Perhaps I'll record me singing later and upload it. What can I say? I am a fan of repetitive chants. They're meditative and relaxing, and great for humming innocuously at work without offending my rather devout coworkers. ;) Add to the fact that repetition and successive loops of song are good ways to move past anxiety attacks, and you've got a music form that I adore. When a relative clause has more than one noun phrase, it must end with a verb, even if that verb is ni. Tafris myn ndaru na ar takh yr zhasharu ni. Fear me wolf-dir.obj rel at roof near chimney is. I'm afraid of the wolf that is on the roof, near the chimney. Relative clauses can be nested. Each one starts with na and follows all the same rules of word order. i.e. describes the cat as being both on the table and near the door. i.e. describes the cat as being on the table and the table as being near the door. You are currently browsing the Conlangers blog archives for January, 2013.